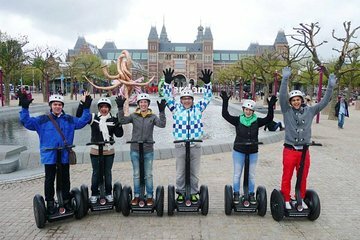 Experimente o melhor de Amsterdã em duas horas em um divertido passeio pela cidade de Segway. Suba a bordo do seu dispositivo elétrico de transporte com autoequilíbrio e navegue sem esforço pelos locais principais. Passeie pela famosa Ponte Skinny sobre o Rio Amstel, gire em torno do charmoso bairro do canal e siga até as atrações de Amsterdã, como a Praça Dam, o Jardim Botânico e muito mais. Faça paradas regulares para fotos e ouça curiosidades sobre os pontos turísticos a partir de um guia informativo. Os números são limitados a nove nesta turnê de grupo pequeno, garantindo uma experiência mais personalizada. I believe Bart was our host and he did a great job. My wife has never been on a Segway but she mastered it well. We saw so much in the time and would recommend this first so you can see Amsterdam and then make choices afterwards. Loved this, and our guide was terrific. There was just the two of us plus the guide that day, so we ended up with our own private tour. Wonderful. I would highly recommend this. You will cover a LOT of ground! We loved this. Talk about taking in the city, rolling through all of its neighborhoods was a priceless experience. Highly suggest booking this. Amazing, absolutely great tour guide, best way to experience Amsterdam! Thank you!!!! I love to segway. It is difficult in Amsterdam due to th bike riders hating them. The roads are so narrow. I still loved it. We enjoyed seeing parts of Amsterdam we'd never seen before due to having wheels to get around quicker, but we really didn't learn anything we didn't already know. The guys are enjoyable to be around, and if you really just want to see the city without having to peddle a bike, I'd suggest this as a way to do it. Riding Seways in Amsterdam was definitely a highlight of our trip!! Francis was an amazing guide -- she knew so much about the city and was eager to share her city with us. I would definitely recommend this tour! I'm giving this 4 stars purely for the joy of riding a Segway and getting brilliant views of the canals and streets of Amsterdam. This is a great city to ride around in. However, we did have a relatively new guide and unfortunately he was not confident about providing commentary detail and volume. So not much was added there. However it is still a great experience and I recommend it as a terrific way to get a walk-free view of a beautiful city. This was a good tour with one disappointment - no audio contact with the tour guide. This is the first Segway tour we have taken in several countries that did not have this audio link. It meant silence until you stopped and sights were discussed and most informative this was. But having been used to an audio link on my other Segway tours I found it strange to not have a running commentary on places we were passing. This was a cold day about 5C and the wind had an added chill factor but the tour was enjoyable. A concern for a couple of people on the tour was discovering that they would be using both cycleways and roads but this was soon put to rest as safety was a paramount concern to the tour guide. The two hour tour gave you a good idea of where everything was, how best to access those areas you were interested in visiting. The lack of audio is the only reason I gave it a 4 out of 5.